The attached lisiting is provided for information purposes only. The Shire of York does not recommend any particular accommodation provider and takes no reponsibility for the services that they provide. 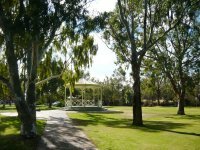 There is availability for a limited number of self-contained RV's to park at Avon Park, for free, for a 24 hour period. There is also a Dump Point available at Avon Park. Fresh water is available, free gas barbques with shaded picnic areas. This area is close to shopping amenities and our famous Suspension Bridge.